This page provides an overview and pictures of the community charity quilts the Guild has made over the years — presented in reverse chronological order. After much discussion as to the theme of our fifth community quilt, we opted to salute the birds that lure birdwatchers to Grand Manan. Nancy Estle designed and made the center medallion featuring the basalt columns at Southern Head with puffins. Mary Hawkins machine appliqueed the puffins to the rocks. Surrounding the medallion are traditional Birds in the Air blocks, and a border of Flying Geese. In each corner are appliqueed shore and sea birds – a murre, spotted sandpiper, red phalarope, and a plover, done by Mary Brown. 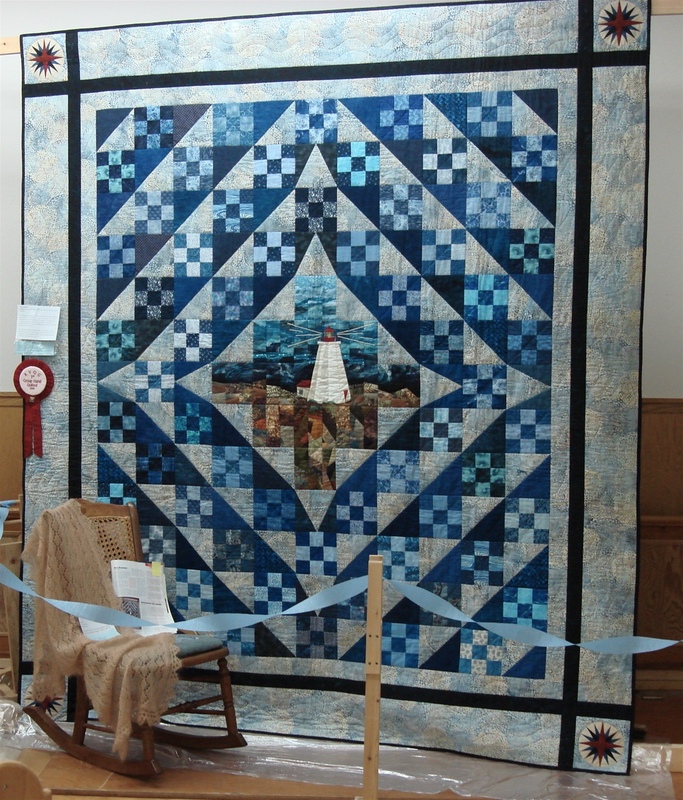 The king-sized quilt is hand-quilted and won “Best in Show” at the Kennebecasis Quilt Guild Show in September, 2015. It was won by a summer visitor who resides in Ontario. 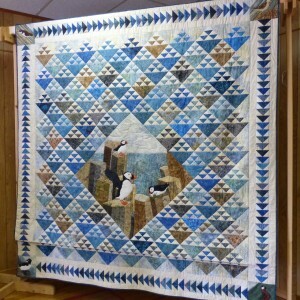 In October 2012 we chose the Swallowtail Keepers Society as our charity to receive this year’s quilt. Swallowtail Lighthouse is one of the iconic symbols of Grand Manan, and since the federal government has turned over the lighthouses to local governments and groups, it seemed fitting that we depict the lighthouse (whose job has been to guide fishermen home in the fog) in shades of pale blues, creams, and grays, with whales, ships and lighthouses surrounding the traditional “Jacob’s Ladder” blocks. 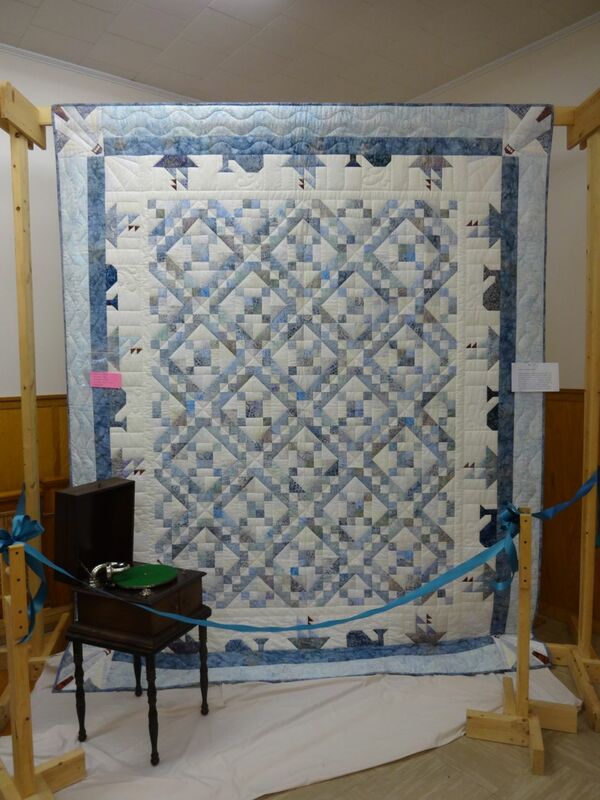 Fogbound won second place for Group Hand Quilting at the 2013 Kennebecasis Valley Quilt Show. 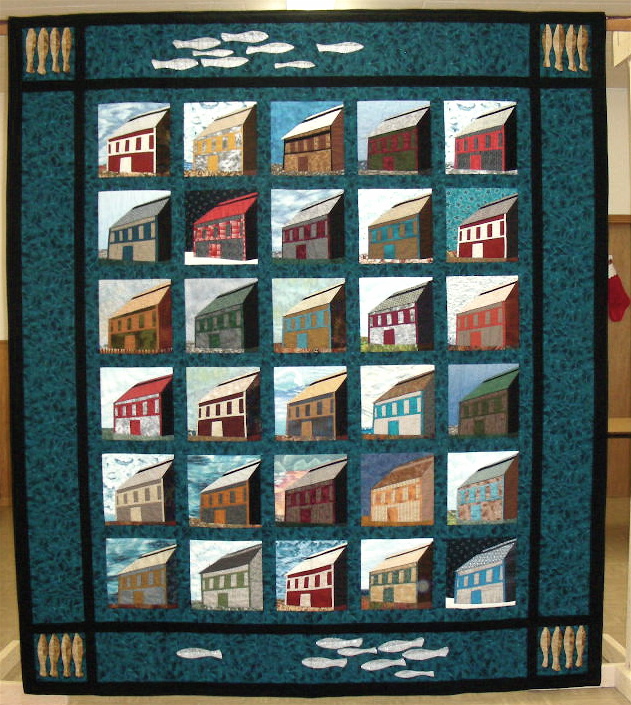 This year we voted to donate our community quilt to the Grand Manan Art Gallery, a relatively new organization on the island. They put up their $300 to cover fabric costs, and we were on our way. Again, Nancy Estle was the designer of this work, supported by several members who agreed that since the quilt was going to the gallery, it had to be especially creative and non-traditional. 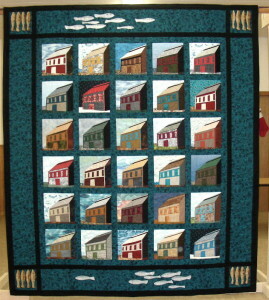 The quilt depicted the Bay of Fundy from top to bottom, featuring lobster, traps, and buoys, as well as fish and seaweed. We used the Bargello technique, with slightly curved horizontal strips graded in value, then cut the strips vertically and off-set each one slightly to give depth to the overall scene. 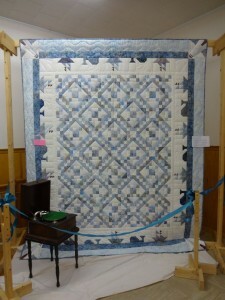 Because of all the seams in this quilt, we opted to have it machine-quilted by Jill Lloyd of Quispamsis, NB. The resulting quilt now hangs in a North Head lawyer’s office. Setting Day won the Judges’ Choice ribbon at the 2011 Kennebecasis Valley Quilt Show, and was featured in an article in the Canadian Quilter Magazine. In October 2008 we started another charity quilt, this time for Action Ministries, a group that maintains the local Food Bank, sends deserving kids to camp, and helps individuals with heat, transportation, and other needs. As with the Rotary quilt in the previous year, the group had to agree to put up $300. to cover the cost of the fabric and batting for the quilt. This time we planned to do traditional blocks surrounding a central block on point depicting Swallowtail Lighthouse. 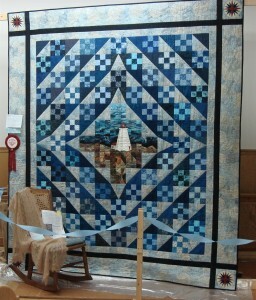 The idea for the overall design came from a quilt seen in the Sussex, NB, quilt show. Mary Brown made exquisite Mariner’s Compass blocks for each corner. Once the quilt top was assembled in March 2009, we put it on the frame and began quilting. On the day the quilting was done, we took it off the frame only to realize that something was terribly wrong. The quilt bulged and bumped, and was not up to our standards, so we TOOK OUT MOST ALL OF THE HAND QUILTING! At this point we started all over again, making sure of the straight grain of the fabric and being careful to feel under the quilt to make sure we were going to be successful. This was one of the most frustrating experiences we have shared as a guild. We finished on time, thanks to many hands who worked many extra days to complete the quilting. “Let It Shine”, as we named this quilt, won first prize for Group Hand-quilting at the 2009 Kennebecasis Valley Quilt Guild show in September . In October 2007 we began to work on our first Community Charity Quilt for the Grand Manan Rotary Club to benefit their Scholarship Fund. We started in October with a design by Nancy Estle celebrating the smoke sheds of Seal Cove. Each block had 28 separate pieces of fabric, and depicted a smoke shed. 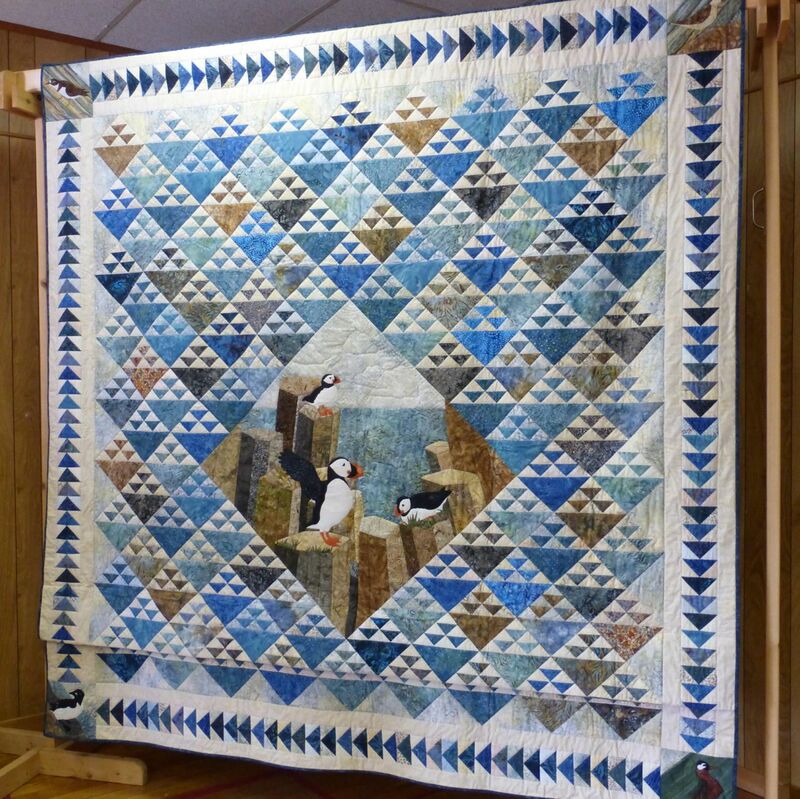 Work went on throughout the winter months, and by April 2008 we had completed the required blocks for a queen-sized quilt, with swimming herring in the bottom and top borders, as well as golden smoked herring in the corners. Hand quilting finished off the quilt……many, many woman hours spent in quilting and enjoying each other’s company. 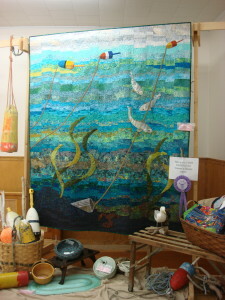 We entered the quilt in the Kennebecasis Valley Quilt Guild show in September, 2008, and won the first place ribbon for Best Group Hand Quilting. The Rotary Club sold tickets on the quilt throughout the summer at the local Farmers’ Market, and by the time the draw was held in November, the club had sold over $6000. in tickets! Our member Gladys Leighton did her part and more, selling $900. worth of tickets, many of them to ferry passengers whom she met going back and forth to the mainland. The winner of “Herring Days”, as we named the quilt, was a Grand Manan fisherman, and his wife and family. Our quilt also made the cover of the Canadian Quilter Magazine.